Courtesy of The Huffington Post about the Chick-fil-A diet. It’s not the worst idea, actually. The Internet has been grilling Chick-fil-A over advice printed on the chain’s takeout bag suggesting people eat a small meal “like an 8-count pack of grilled nuggets” every few hours for better health. Chicken nuggets every three to four hours does sound terrifying, at first. But the chain is recommending its grilled chicken nuggets, essentially eight pieces of grilled chicken with 23 grams of protein and just 140 calories. With 530 milligrams of sodium, they’re well under the daily limit of 2,300 grams recommended in U.S. dietary guidelines. And they have less than one third of the daily cholesterol limit for healthy people. While chicken nuggets for EVERY meal certainly won’t give you all the nutrients you need, grazing on a variety of small meals throughout the day is indeed a smart idea. A 2015 study found that people who did this tended to choose healthier foods and weigh less overall than those who consumed larger, less frequent plates. Five or six small meals per day also stabilizes blood sugar while maintaining muscle mass and metabolism. Such meals could consist of veggies, sandwiches, or yogurt with fruit, according to nutritionists. Or, they could be Chick-fil-A’s grilled chicken nuggets, which contain waaay fewer additional ingredients than other fast-food nuggets. Yummm. Of course, there’s a risk to visiting a fast-food restaurant in search of a “small” snack. Most of us are horrible at estimating how many calories come in fast food meals, and 92 percent of them exceed the recommended amount of calories for a single day. 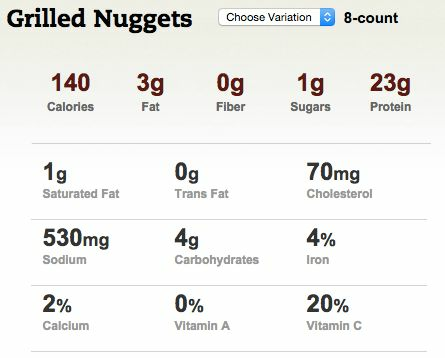 So if you don’t have grilled nuggets handy, you might wanna stick with those old-fashioned sources of protein instead. Bring on the eggs!